come on board and sign up to our surf and help newsletter. once in a while we are mailing news, offers and and other interesting updates. Surf & Help is a non-profit organization combining the fun of surfing with supporting social and environmental causes. We run events, surf camps and educational activities that partner, visit and support carefully selected non-profit projects. The profits of these activities are used to support these social and environmental causes. Explore the fantastic waves and empty line-ups and dive into the heartwarming country and culture Senegal in the heart of West Africa. Location: The surf school is located at the beach of Yoff. The beach and surf spot in front of the camp is perfect for learn to surf and offers fun waves for advanced surfer. Enjoy the kilometres and kilometres of sandy beaches or the close-by world class waves of the Almadies peninsula and Ngor island. Also the vibrating center of Dakar is only a short taxi ride. About the camp: The Malika Surf Camp is our recommended choice in Senegal. Our Surf & Help team did already two trips to Malika Surf Camp and we were stoked about the surf we found and especially the friendly and familiar experience generated by the owners of the camp Aziz and Marta and their lovely team. There are still very few surfers in Senegal which gives you the chance to enjoy high quality waves even more. Because of the geographical location of the camp on the Almadies peninsula you can find the right spot for most all swell and wind directions. About the accommodation: The camp or “La Maison des Surfeurs” surf house is in front of the beach, with a big garden all around and an outside patio. On offer are shared and private rooms, with private and common toilets. The rooms have mosquito nets and a fan. And the camp provids a big breakfast and dinner with European and Senegalese tastes. Also, daily housekeeping and available laundry service. Broad-band internet wi-fi for free for the guests. Testimonials: Not only our team has only good things to say about Malika, check other on Tripadvisor. Season: The camp is open all year round and due to the location receives north and south swells (more common during the summer months. * Already the surf movie classic 'Endless Summer' made in 1966 showcased the wave 'N'Gor Right" which is one of the nearby surf spots. 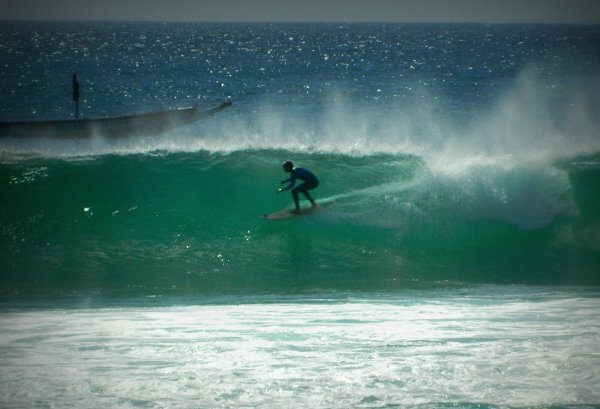 * Always on the best line up of the best waves of the day with our local surf guide Aziz. Every day a personal coaching on the best spot for you: Vivier, Secret, Club Med, Ngor, Ouakam for intermediate and expert surfers. How to get there: The camp is just a short taxi ride from the Léopold Sédar Senghor International Airport and somebody from the team can easily pick you up at your arrival. 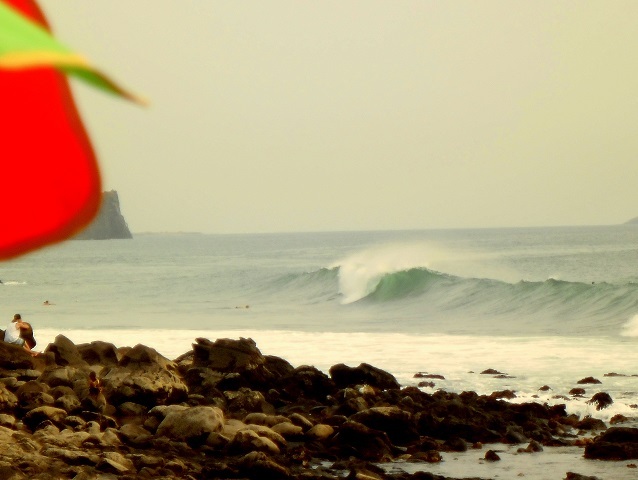 Find more surf packages on the Malika camp's website. We will send you the details and final price of our requested package before you decide on making your reservation. All of our activities are supporting a good cause and as part of our partnership with the Malika Surf Camp we are supporting a boarding school project in the nearby town Malika. Aziz, the co-owner of the camp, grew up in Malika and went to the school himself. Aziz and the guests can organize a visit to Malika and give a little support in whatever is needed at the time of your stay. E.g. during our trip we brought some water filters to the school. 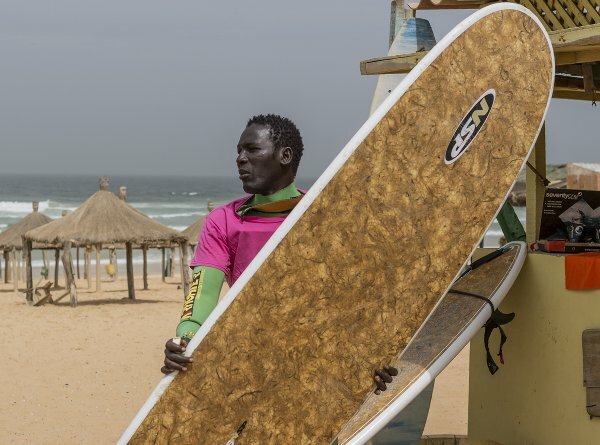 With the project Solidarity Surfers you can support the local surf in Senegal, where boards and wetsuit are too expensive for young local surfers. So you can bring any sort of surf equipment and be sure that it will be of help. How to make my reservation? Step 1: Choose the package with dates you like to book either from the packages mentioned here or visit the Malika camp's website and submit our reservation request form. Questions? Just contact us or the Malika team. Step 2: We send you the details of your surf camp package including final price and payment details. Step 3: You confirm your reservation and send payment. In case of any questions on the camp, the packages, prices or the help factor, just contact us.